William Blake once said: “I must create a system or be enslaved, by another man’s.” Creating a system for working with trends and innovation is crucial. Using a multidimensional methodology helps companies identify long-term trends in society and harness these insights into opportunities that can inform and inspire innovative minds. Trend mapping is my system to define the needs of tomorrow’s people. This enables companies to create ‘intelligent’ future scenarios. Sustainability and conscious consuming has become a new religion and a culture influencing all areas of life. Consequently tomorrow’s innovation models must be built on sound green strategies – especially because it makes good business sense. 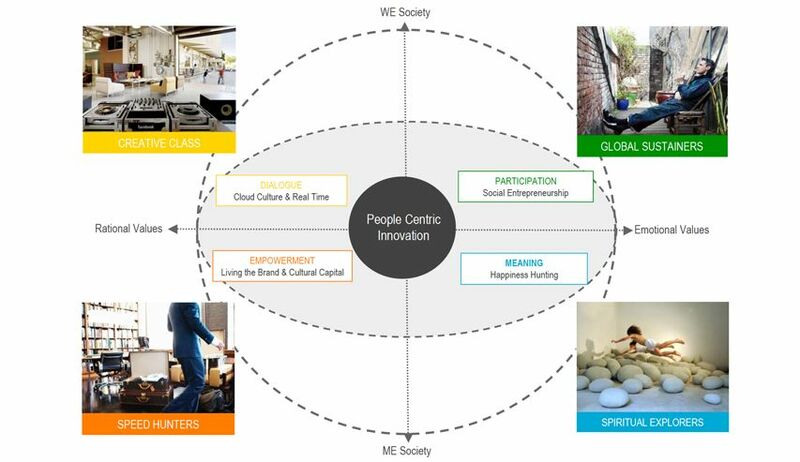 Therefore implementing a 4P mindset and bottom line – considering Planet, People, Pleasure and then Profit will provide the building blocks for a sustainable and social innovation model benefitting the greater good. But the reality is that we live in a time of contrast and diversity. People talk about ethics and sustainability while many still consume away. So how do we address and balance these contradictive behaviors and demands? This clearly requires whole brain thinking where left brain (analysis/detail) and right brain (vision) come together. This will provide organisations with a system to work in a broader context inviting them to look from ‘the outside in’ to implementing the best solutions benefitting the planet, people and the business alike. These macro trends affect us all and indicate a polarised society made up of patchwork tribes who share value sets across conventional geographic borders. We are moving away from traditional demographics into a deeper more profound understanding of people. A world made up of contrasting mindsets – Hunters the Me people and Gatherers the We people. To inspire innovative minds companies must appeal to both groups. On a Rational Level: People want to feel Empowered when engaging with the brand and company culture. Real-time Dialogue on the cloud inspires creativity and human-networks. On an Emotional Level: Social Participation fulfills people’s need for value-related self-expression that brings Meaning and balance in life, which is essential for finding happiness. * Speed Hunters bond with empowering and informed propositions that provide engagement and efficiency. * Creative Class bond with interaction and ‘real-time’ dialogue and I that provide creative development. * Global Sustainers enjoy participation, authentic experiences and thinking differently within a group setting. * Spiritual Explorer want the ‘real thing’ and expect honest and meaningful values and emotional progression. As the mindsets demonstrate, we are experiencing a paradigm shift where life priorities are changing. Inspiring innovation means changing the way we think. Companies must be people-centric, demonstrating empathy for the culture in which they operate and exist. People are not just passive consumers – they are creators and potential change agents. Inspiring break through innovation is essentially about the ability to engage a whole brain culture for the purpose of empowering people. Dare to be different – think from the outside in.